Cuneco is a Danish research project, developing, testing and implementing standards for data exchange through all building processes from conception and design through execution to operation and maintenance. The graphics representation should only form a framework for both those who make the demands, and for those who must meet them. Part of this note is based on cuneco Project 12061 Classification of Properties and cuneco Project 13011 Levels of information. This Note argues that the graphical representation not necessarily follow developments in Levels of information, but that the designer on each of seven Levels of information can choose one of three graphical representations, SOLID, OUTLINE and DETAIL. The graphical representation is symbols and avatars, only constitute the basis for a common framework of understanding in respect and expectation of professionalism, so it is important that the requirements does not become common technical drawings. Design in 3D with intelligent tools has initiated new and exciting tools, new workspaces and new forms of cooperation, but it also meant that the implicit understanding has been replaced by a more explicit perception and interpretation. All actors in the construction industry has a professional understanding of both the design process and construction process, an understanding and knowledge we have to respect in the world of 3D building modelling, and therefore necessarily must respect and recognize implicit and not formalized assumptions. The problem is when a non-formalized assumption is based on real, concrete knowledge, and when it is based on conventional thinking, formalities and reactions, that are related to a traditional project view, both in form, scope and method of cooperation. 3D building model contains at any time both tentative and concrete information, with a rising degree over time, so therefore a design project is containing both preliminary and specific information on different Levels of Information. This information is used widely across organizations for various purposes such as basis for analysis and calculations, price calculations, scheduling, energy calculation, execution basis and visuali-zations. This provides great challenges in communication of this information, as not all information is intended as validated by the sender, but the partner may be perceived it as valid information that can be used as a basis for further project work. 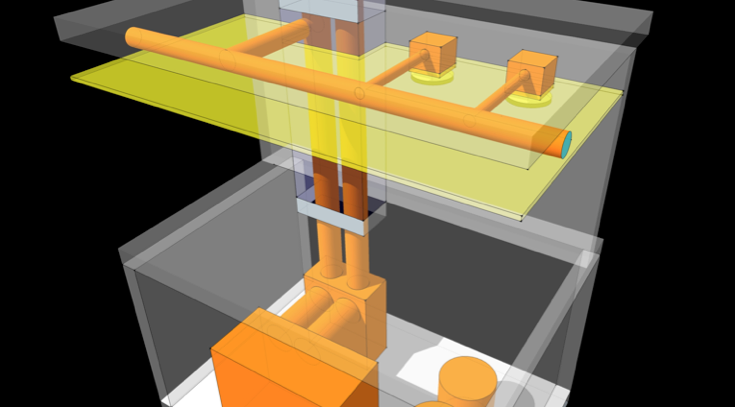 Often, a 3D digital model creates the illusion of completion and information, which is really not present. 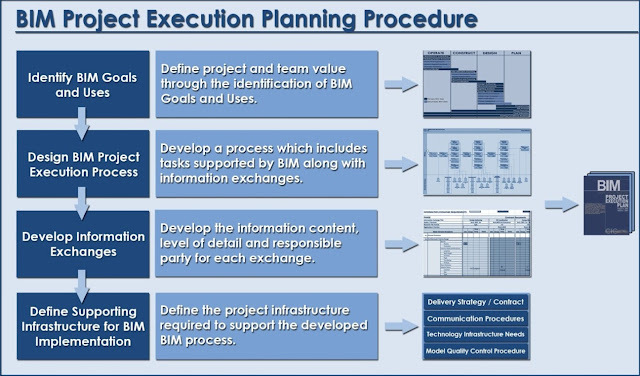 The method must support the information management throughout the construction life cycle, from concept to design, to the execution and for the operation and maintenance. Slide 02 : The amount of total information and the amount of valid information. The Construction industry handles and communicates information widely with varying validity, and it is therefore essential to realize the need to be able to make precise requirements for the scope, the quality and the definition of information. Level of Information creates a tool that enables a clear communication of the validity of the information that may be contained in the project documents as well digital as analogue. For information transfers and requirements between actors it thus will be clear to both the passer as the one who receives the explicit information contained, and at what Level of information they are located. The method must support the information management throughout the construction life cycle, from concept to design, through construction, and for operation and maintenance. The Level of Development (LOD) is a reference specification developed by The American Institute of Architects. The method makes it possible for all parties in the building process to establish clear and specific agreements on communication of data related to Building Information Modeling. They define and illustrate the characteristics of building objects in various building systems at different Levels of Development. This clear articulation makes it possible to communicate, understand and define valid information so that it is possible for all parties clarify both the possibilities and limitations of the 3D building models that are exchanged between the parties in the construction process. LOD thus ensures consistency in both the communication and performance by facilitating a clear definition of deliverables through a project from idea to DV. Level of Development today interprets LOD in two ways, Level of Detail is perceived as an internal development of the detailing, while the Level of Development is a concretization at an agreed stage pass. All Levels of information systems includes illustrations showing a linear development of project documentation, but these illustrations does not support the BIM method's great potential for iterative project development, where the components are undergoing a progressive elaboration throughout the project life cycle. This iterative project development means that new ideas be assessed, approved or replaced by new ideas, so therefore the project continuously is analysed, reviewed, improved, developed and refined to a progressively more detailed and specific information model and with an increasing degree of available information, both as implicit knowledge and as explicit knowledge. Therefore there is a need for a much more flexible solution, a solution that can handle the iterative project development, and respects and expects professionalism. The Danish Construction company MT Højgaard requirements for Levels of information is based on US LOD requirements, and Copenhagen Property is for now implementing similar methods which requires graphics with a linear development and therefore not include and support the digital iterative context. 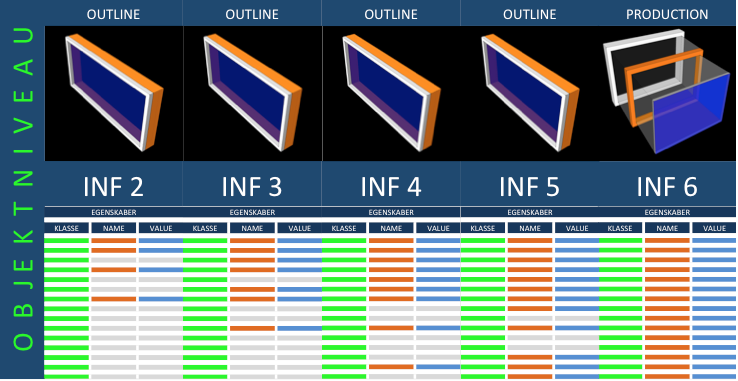 The software company VICO is working with so-called Primitives, with graphics within specific categories of objects, but where the graphic also illustrates a linear project development. The iterative project development implies a much more flexible methodology, where the requirements for the graphic expression can be selected on the basis of three form concepts SOLID, OUTLINE and DETAIL, and so that they do not necessarily follow the development of information levels, as shown in the examples in Slide 06 below. Slide 05: The graphics follows the increasing amount of information. The problem is that all projects that include Levels of information, based on a graphic interoperation initiate the development of creative expression, that follows the increasing amount of information. This can cause erroneous interpretations about what properties information may actually be linked to a specific Level of information. A graphic showing layering on LOD 300 does not necessarily indicate a requirement for all layers to be displayed graphically, but can only be property informations about the number of layers in the specific construction. Slide 06 : The graphics do not follow the increasing amount of information. 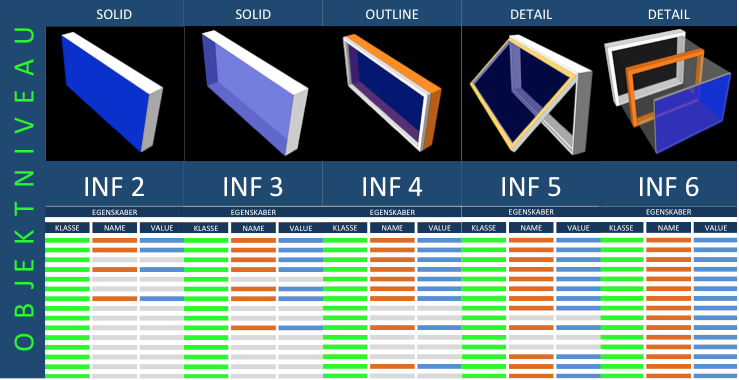 Determine requirements for graphics within groups of building elements, not for individual building elements, it will be impossible to handle requirements for individual building elements at seven Levels of Information. The proposal focuses therefore on three graphic expressions within 4 groups, a grouping which is based on common characteristics of objects. Determine requirements for three geometric concepts that are not related to specific levels of information, but are defined solely in relation to the context of the project. The object is represented as a generic object, that defines the object's construction space and space for mounting. 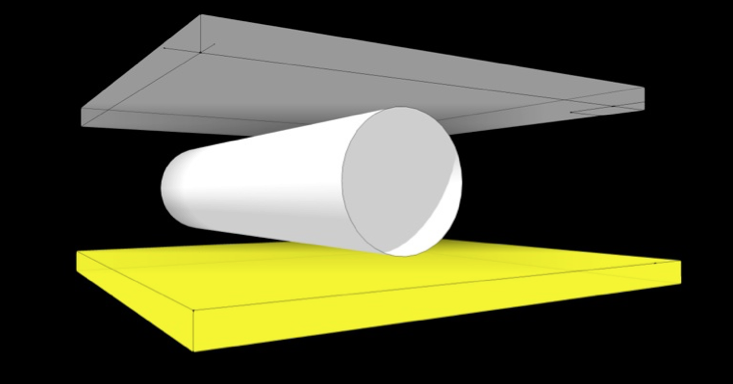 The object is graphically represented as divided into layers and components that are represented by construction space, space for mounting and recesses for technical main routing. The object is represented graphically divided into layers and components with profiles represented by a measured dimension and location, and relationships to adjacent objects so that the object design is coordinated. The Construction Company DPR from the United States works with 4 Levels, as can be related to the proposed three geometry representations and a FABRICATION INSTALLATION level from DPR. 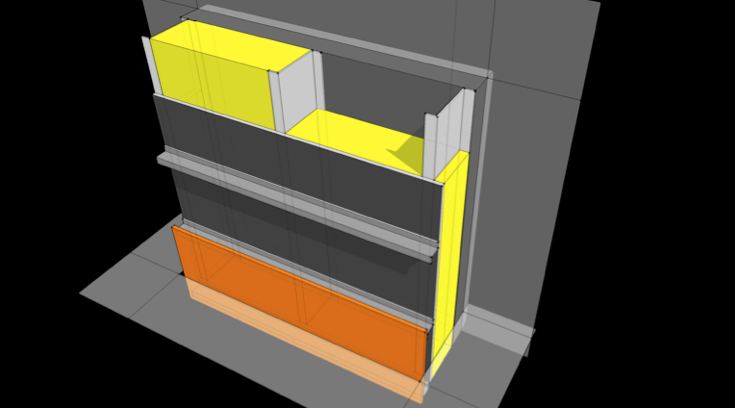 A montage of a plasterboard wall could well be carried out on the basis of OUTLINE, need not necessarily by DETAIL, but it is of course essential that the installer has very detailed information from the supplier, an installation worksheet which can contain both text, drawings and videos. 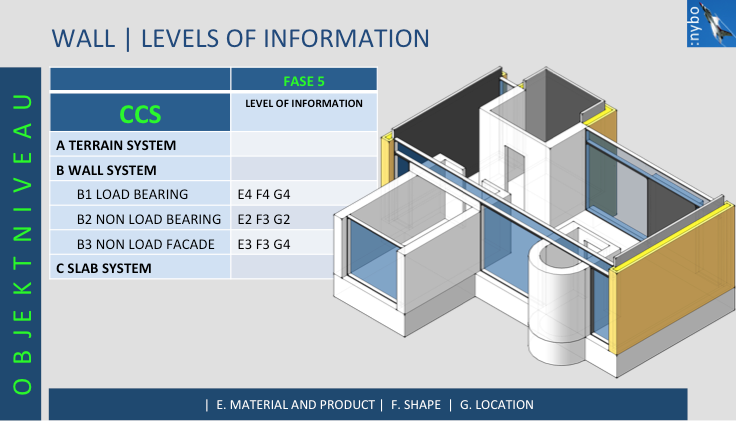 DPR related requirements for graphics along with the four levels of information, Level 1-4, as shown in the following sketches, and subsequently the proposal SOLID, OUTLINE, RETAIL and PRODUCTION related to DPR's objective descriptions of the 4 Levels. I en artikel den 29. november 2013 i Politiken, Nedtur. De kreative har svært ved at tjene penge anføres det, at et fald i antallet af fuldtidsbeskæftigede arkitekter, fra 6.500 i 2008 til godt 5.000 i 2012 har betydet et fald i indtjeningen i den kreative branche. Den kreative branche kan have svært ved at tjene penge, men faldet i antallet af beskæftigede siger ikke noget om indtjeningen. En effektiviseringen af produktionen efter krisen i 2008 og et skarpt fokus på kernekompetencerne, har betydet at flere tegnestuer trods et fald i medarbejderstaben, har kunnet øge deres indtjening på et marked, der har været, og stadig er, præget af lavvækst og høje omkostninger. Et af landets førende og største arkitektfirmaer, Arkitema Architects, præsenterede et 2012 regnskab med et overskud 21.5 mill. kr. Administrerende direktør og partner Peter Berg anfører, at fremgangen først og fremmest kan tilskrives medarbejderne, der har øget deres produktivitet markant. 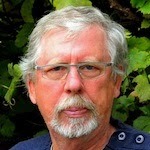 Endvidere peger Peter Berg på et målrettet internt arbejde med en effektivisering af alle arbejdsgange blandt andet ved, at firmaet har implementeret BIM, Building Information Modeling, således at der på alle opgaver arbejdes med 3D virtuelle modeller af bygningerne. Denne tendens, som sammen med kravet om, at rådgiverne skal levere hurtigere og skal levere en række nye IKT-ydelser for et honorar, der er under pres, har betydet, at Arkitema Architect har en forventning om en betydelig lavere indtjening i 2013. De nye digitale værktøjer stiller store krav både til virksomhedens ledelse og til de ansatte, krav om nye strategier, kompetencer og arbejdsprocesser og det er helt afgørende, at der rettes et politisk fokus på disse udfordringer, da det har stor betydning for regeringens vækstplan for det kreative Danmark. Hvordan understøtter og implementerer man disse nye processer, der kræver en gennemgribende omstilling af en hel branche, ikke bare i Danmark, men også internationalt. Netværket BIM Aarhus afholdt i oktober 2013 Konferencen BIM United Kingdom, hvor indlægsholdere fra den britiske byggebranche fortalte om den digitale BIM udvikling i UK. På konferencen BIM UK oplevede de 320 deltagere den stærke konsensus og det intensive engagement, der i UK forekommer at være etableret mellem byggeriets mange parter og den britiske regering. Dette er desværre ikke tilfældet i Danmark. På trods af gode intentioner, og mange udviklingsprojekter, er det her ved indgangen til 2014 stadig ikke lykkedes at skabe det nødvendige og afgørende politiske og faglige ejerskab og konsensus omkring de nye digitale samarbejdsprocesser, og mange i bygge-branchen ser disse udviklingsprojekter som utilstrækkelige, uden faglig fokus, fortænkte og fragmen-terede. Der er således et stort behov for at sætte ambitionerne for Digitaliseringen af Byggeriet ind i en større samfundsmæssig sammenhæng. Dette vil være helt nødvendigt for at kunne opfylde visionen om en kunstnerisk, teknologisk avanceret og bæredygtig udvikling baseret på en øget produktivitet og kvalitet i byggebranchen, en udvikling der, som i UK, har bred politisk opbakning, indsigt og bevågenhed. BIM Aarhus præsenterede på netværksmødet den 24. januar 2013, BIXS Building Information Exchange System, en cloud baseret kommunikation mellem bygherre, projekterende og systemer. Softwarefirmaet Cad-Q viste med eksempler fra Karolinska Sykehus i Stokholm, hvordan systemet var anvendt i forbindelse med projektering af et projekt på 320.000 m2. BIXS er udviklet i samarbejde med White Tengbom Team til NKS, Nordisk Karolinska Sykehus i Stokholm. Systemet bygger på nyudviklede funktionaliteter i forbindelse med kommunikation af data til og fra BIM-modeller. Løsningen indeholder flere moduler til at håndtere, skabe og dele data, og betyder, at man kan forbinde forskellige softwaresystemer og udveksle information mellem disse platforme. Systemet bygger på agile projekterings-metoder, SCRUM planlægning og LEAN som en metodik til at målrette projektplanlægningen. Et meget spændende indlæg, om hvordan man organiserer et så omfattende projekt, og om hvordan man bevarer overblikket i forbindelse med planlægning, projektering og styring af så store informationsmængder. Projektgruppen indså, at det ikke ville være muligt at projektere det samlede projekt i én bygningsmodel, og man udførte derfor en meget detaljeret analyse af projektet, en analyse der omfattede målsætning, tid, faser, informationsopbygning, informationsudveksling, flow, kvalitetssikring, proces og ansvar. På bagrund af denne analyse og flere andre parametre såsom logisk fysisk opdeling og forventede svartider blev projektering af Karolinska Sykehus på 320.000 m2 opdelt i 16 bygningsmodeller, alle koblet op på én database, der blev brugt til koordinering og til at sikre kvalitet og konsistens i det samlede projekt. Der var flere forudsætning for, at dette kunne lade sig gøre. Et afgørende ele-ment var, at Skanska som totalentreprenør på projektet, stillede meget præcise krav til både projektforløbet, til kvaliteten, og til kontrol af proces og resultat. Det betød store udfordringer til rådgiverne, med krav om dokumenteret ROI, Return of Investment, synlig og dokumenteret effektivisering med fokus på proces, way of working, hvem leverer hvad til hvem og hvorfor. Projektgruppen, både rådgivere og bygherre, identificerede i den indledende fase disse store udfordringer gennem et omfattende udredningsarbejde, visualiseret på procesdiagrammer, og efterfølgende blev anvendt som styringsredskab under projekteringen. Implementering af dette værktøj betød at projektgruppen og bygherren kontinuerligt kunne følge projektets fremdrift op mod denne plan, og straks reagere på afvigelser. Skanska og projektgruppen udførte således en målrettet, detaljeret og omfattende planlægning før projektstart. Hverken totalentreprenøren eller rådgiverne var inden opstart på BIM projekteringen i tvivl om mål og midler, og alle parter tog udfordringen op. Resultatet blev en veldokumenteret BIM Project Execution Plan, der sikrede, at alle parter var helt klar over den rollefordeling, de muligheder og det ansvar, der var forbundet med implementering og brug af BIM i dette meget omfattende projekt. Der er ingen tvivl om at procesanalysen, kombineret med LEAN metoder og SCRUM principper, har betydet et evident bedre projektforløb for alle parter. Kompleksiteten i et så stort projekt er indlysende og helt åbenbar for alle parter, men det er min opfattelse at mange, både bygherrer og rådgivere, er blevet overraskede over komplekse forløb og strukturer i rigtig mange BIM projekter uanset størrelsen, forhold der har været medvirkende til, at mange BIM projekter ikke har haft et optimalt flow, og har givet anledning til frustration både i projektgruppen og i forhold til bygherren på grund af manglende eller uklare aftaler, og manglende forventningsafstemning. Der er ingen tvivl om, at netop den metodik, de mål, analyser og virkemidler, som man opstillede og anvendte på Karolinska Sykehus, med stor fordel kan anvendes på alle BIM Projekter. Inden projektstart gennemføres en audit, der skal sikre konsensus omkring BIM projekteringen blandt alle involvere parter. Metodikken for gennemførel-se af en BIM projektanalyse er ikke ukendt for rådgiverne, den er et nyt værktøj i en lang række af værktøjer, der i dag anvendes eller i hvert fald burde anvendes, i forbindelse med projektopstart, herunder udarbejdelse af organisationsdiagrammer, fordeling af roller, opstart workshops samt afklaring af ansvar og grænseflader. Målet for denne opstartsaudit er at fastlægge en struktureret procedure for BIM projekteringen, således at man derved sikrer en optimal proces og kommunikation internt i projektgruppen og mellem bygherren og projektgruppen. Der er ikke kun én metode til at sikre en succesfuld BIM implementering på et projekt, og derfor skal hvert team initiere en udførelsesstrategi med udgangspunkt i det konkrete projekt. Det betyder, at et af de allerførste trin i udviklingen af en Projektanalyse vil være at identificere den optimale anvendelse af BIM baseret på bygherrens og projektholdets analyse og målsætninger i relation til projekts karakteristika. Alle i projektteamet skal kende og kunne agere på den fremtidige brug af de informationer som de implementerer. Netop den fremtidige brug af data kan og vil i langt de fleste tilfælde indvirke på de metoder, der bruges i modeludviklingen. Det er derfor essentielt, at man med udgangspunkt i en BIM proces-analyse afklarer alle forhold i forbindelse med BIM projektleverancer og informations-udveksling, således at man inden projekteringen påbegyndes, har fastlagt klare aftaler omkring kommunikation, procedurer, teknologi, ansvar og kvalitetskontrol i forbindelses med BIM projektleverancer. 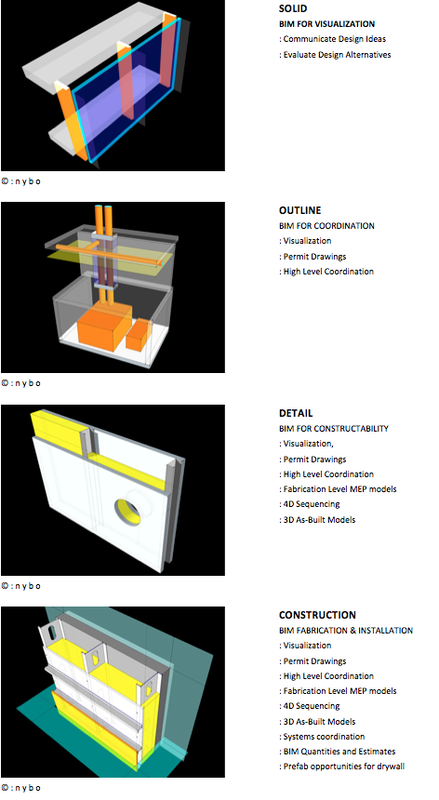 Et rigtig godt værktøj til denne proces kan findes i BIM Project Execution Plan, en guide og et værktøj til planlægning og implementering af BIM udviklet af BuildingSMART i samarbejde med BSA, der udgiver National Building Information Modeling Standard (NBIMS) i United Kingdom. Vejledningen er udformet som en praktisk håndbog med templates, der kan bruges af projektteams til at analysere og fastlægge BIM-strategier og på baggrund heraf udarbejde en projektspecifik BIM Project Execution Plan. BIM er ikke bare a day at the office, BIM kræver omhyggelig planlægning og en tilbundsgående projektanalyse før opstart, enighed om mål og midler, ellers fortoner de oplagte fordele sig i tåger af usikkerhed og forvirring. Ingen BIM uden management, Building Information Management. Værktøjerne og erfaringerne i forbindelse med en BIM Projektanalyse findes, så med denne analyse, opbygning af enkle modeller, link til eksterne databaser, kun need to know, ikke noget med nice to know, er der oplagte muligheder for at sikre et godt grundlag for en succesfuld BIM implementering og projektering. E i g i l N y b o. Simple theme. Powered by Blogger.